The House of Grimaldi is associated with the history of the Republic of Genoa, Italy and of the Principality of Monaco. The Grimaldi descend from Grimaldo, a Genoese statesman at the time of the early Crusades. He may have been a son of Otto Canella, a consul of the Republic of Genoa in 1133. In turn Grimaldo became a consul in 1160, 1170 and again in 1184. His numerous descendants led maritime expeditions throughout the Mediterranean, the Black Sea, and soon the North Sea. They quickly became one of the most powerful families of Genoa. The Grimaldis feared that the head of a rival Genoese family could break the fragile balance of power in a political coup and become lord of Genoa, as had happened in other Italian cities. They entered into a Guelphic alliance with the Fieschi family and defended their interests with the sword. The Guelfs however were banned from the City in 1271, and found refuge in their castles in Liguria and Provence. They signed a treaty with Charles of Anjou, King of Naples and Count of Provence to retake control of Genoa, and generally to provide mutual assistance. In 1276, they accepted a peace under the auspices of the Pope, which however did not put an end to the civil war. Not all the Grimaldis chose to return to Genoa, as they preferred to settle in their fiefdoms, where they could raise armies. 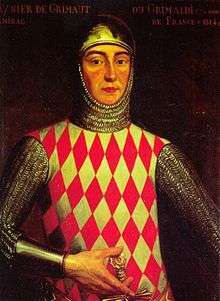 Until 2002, a treaty between Monaco and France stated that if the reigning Prince ever failed to leave dynastic offspring then sovereignty over the Grimaldi realm would revert to France. The 2002 agreement modified this to expand the pool of potential heirs to dynastic collaterals of the reigning Prince (excluding adoptive heirs, hitherto allowed, e.g. 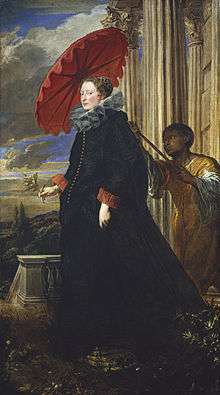 Princess Charlotte and her descendants), guaranteeing Monegasque independence. 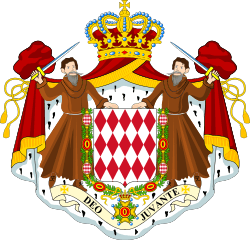 Article I of Monaco's house law requires that the reigning Prince or Princess bear the surname of Grimaldi. The coat of arms of the House of Grimaldi is simply described as fusily argent and gules, i.e., a red and white diamond pattern.